As you know, every trunk has a lesson for us, if we’re willing to look hard enough. Some trunks teach us about perseverance, some about unconventional thinking, and some, like this one, remind us of the value of keeping things simple. 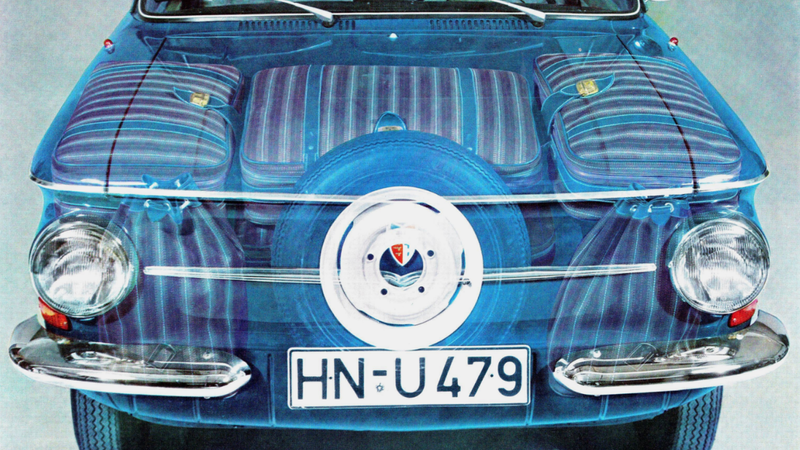 Everyone, please welcome today’s inspirational trunk, the front trunk of the NSU Prinz. This one is actually a 1961 NSU Prinz 4, which was the first extensive re-design of the original, much curvier Prinz. The redesigned Prinz featured very crisp, clean, unashamedly boxy styling that was clearly influenced by the first-generation Chevrolet Corvair. Like the Corvair, the Prinz was a rear-engined car, tucking a little 598cc inline-twin transversely at the rear. The Prinz was quite a small car, really, smaller than a Volkswagen Beetle, for example. Even so, it managed to have a much more cavernous luggage area, all thanks to its remarkably straightforward and rational design. The car is quite literally a three-box design. If there’s one thing boxes are good at, it’s enclosing volumes of space, and, as we all know, all a car’s trunk really is is a volume of empty space trapped via skins of sheet metal and so carried along with the car. The volume of space the Prinz’ trunk enclosed was about the maxiumum volume you could get within the reasonable boundaries of the car. Look again at that ghost-image up top, and then look again at all that lovely matching luggage laid out in front of that strangely young-looking bellhop. That’s a hell of a lot of luggage to cram into the trunk of a genuinely tiny car. That’s eight good-sized pieces of charmingly-matched luggage. Sure, the two bags on the right there need to be soft to cram into the spaces on either side of the spare tire, but there’s no shame in soft luggage. This is all the more impressive when you realize this is a rear-engined car, since front trunks (fine, frunks) are notoriously more difficult to make spacious. Also impressive is the fact that NSU’s designers even saw fit to include an extra bit of luggage space behind the rear seat, similar to the luggage well in a VW Beetle. The only place where it seems they could have perhaps tried to really push things would be at the very rear of the car. You can see in the cutaway that the engine is mounted almost exactly over the rear axle, and, being transverse (and tiny) doesn’t extend back very far. Perhaps they could have made an incredible third luggage compartment at the very rear? Even so, you have to respect this Little Prince’s remarkably efficient use of space. And it’s all done without any trickery or complex solutions. Just a good, clean, straightforward approach, handled with humble confidence. There’s a lot we can all learn from such a trunk.